Pure and Simple Solutions to Liquid Chromatography Problems. you that we have the pure and simple chromatography solutions. 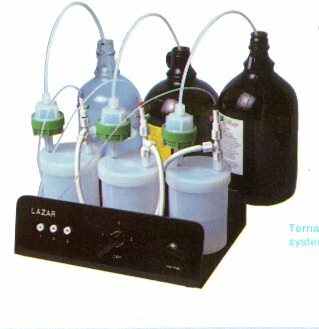 solvents can be run from one vacuum source. can be attached to any vacuum source. *All PFA fluoropolymer construction- inert to most solvents, aqueous or organic. the filter and you're operational. *In-line device can filter/degass 1 gallon in less than 10 minutes. 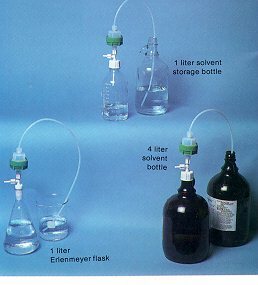 *Vacuum line also establishes siphon to transfer solvent to storage bottle. contribute to particles in the mobile phase. Filter Degasser			   FG-256	    with 38 mm cap.
" FG-256-33	    with 33 mm cap.
" FG-256-28	    with 28 mm cap.
" FG-256-24	    with 24/40 std. taper.
" FG-256-22	    with 19/22 std. taper.
" FG-256-35	    with 40/35 std. taper. meter porosity)					    pkg. of 10. HIGH PURITY PREPARATION OF SOLVENTS AND SAMPLES. *All fluoropolymer construction for chemical inertness. 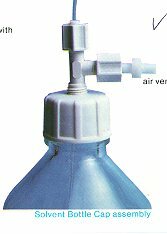 *All fluoropolymer funnel-volume 150 ml is standard with 300 ml optional. *PFA fluoropolymer screen to hold filter membranes. *Costs significantly lower than all competitive units. Chempure system is useable with most organic and aqueous solvents and samples. Chempure Filtration System	   CP-256	    with 38 mm cap.
" CP-256-33	    with 33 mm cap.
" CP-256-28	    with 28 mm cap.
" CP-256-24	    with 24/40 std. taper.
" CP-256-22	    with 19/22 std. taper.
" CP-256-35	    with 40/35 std. taper. porosity)					    vents, pkg of 10.
dispensing of solvent which has previously been filtered and degassed. 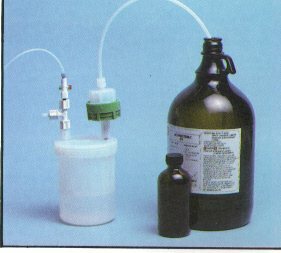 solvent bottle (38mm caps) or 500 and 250ml bottle (28 and 33mm caps). minimizing air contamination and solvent evaporation is included. Filter Reservoir Cap		      FRC-1		cap, 38mm.
" FRC-4		cap, 24/40 std. taper.
" FRC-5		cap, 40/35 std. taper. transfer. The use of vacuum minimizes reabsorption of atmospheric gasses. Dispenser Reservoir Cap		      DRC-1		cap, 38mm.
" DRC-4		cap, 24/40 std. taper. possibility of implosions during a vacuum process. fluoropolymer siphon for vacuum solvent transfer directly to the solvent bottle. is delivered to the pump via 1/8 TFE tubing with ¼-28 end fittings. be purchased separately for use with glass or other types of solvent bottles. pure funnels and system console.